Rebuilt Eaton Transmissions From The Truck Drivetrain Experts « Truck Drivetrain Co. Rebuilt Eaton heavy-duty and mid-range manual truck transmissions and parts available from the truck drivetrain experts. We stock rebuilt Eaton all 5, 6, 7, 9, 10, 11, 13, 15 and 18 speed transmissions and offer International shipping with same day service on all units. We also stock a full line of New and Factory Re-manufactured Eaton Truck Transmission units for Sale. All models are in stock now with same day shipping on all Eaton units and parts. 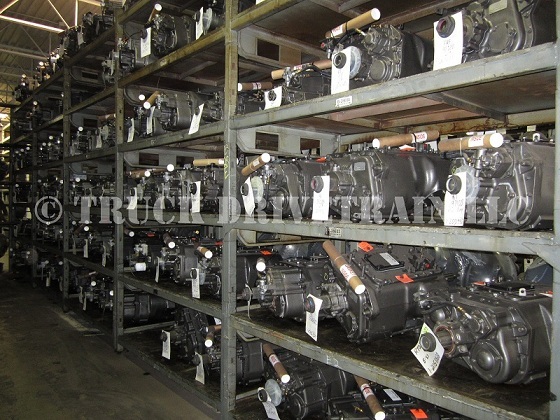 Rebuilt Eaton mid-range transmissions: 5 and 6 speed and heavy duty truck transmissions ready to pickup or ship today. All Rebuilt Eaton transmissions are sold exchange or out right with or without a core charge. 13 and 18 speed models will require a core exchange. We also stock repair parts such as gears, shift forks, shafts, gasket & seal kits, rebuild kits, bearing kits and gearing. When you need to repair or replace your truck transmission by Eaton, we can supply the units or parts your need at discount prices with low cost worldwide delivery and shipping.